Reunited After 50 Years, An Algerian Buena Vista Social Club Makes Its U.S. Debut A group of Jewish and Muslim musicians who played together in the bars and cafes of Algiers in the 1940s and '50s thought they'd never see each other again. But after a chance encounter one of them had with a tourist in an Algerian bazaar, their lives changed forever. Oud player Rachid Berkani, 76, is one of the musicians of El Gusto. Stories of old friends finding each other again aren't all that surprising in the age of Facebook and Twitter. But sometimes, those reunions can lead to the opportunity of a lifetime. A chance encounter between a tourist and a mirror maker in an Algerian bazaar led to the reuniting of Jewish and Muslim musicians — friends who'd been apart for 50 years. Now they're touring the U.S.
Algeria was a different place in the 1940s and '50s: Muslim and Jewish musicians played together in the old Casbah in Algiers, the nation's capital. And there was no distinction between them, recalls 80-year-old singer and guitarist Luc Cherki, a Jew who was born in the Casbah. "We were always together," Cherki says. "There were never 'Jewish' or 'Muslim' parties where we didn't have a mix. I myself saw a witness at a marriage — a Jewish marriage ceremony — where the witness was Muslim." These artists played the secular, popular music of Algeria known as chaabi. It's what they call music of the streets — songs about love, joy, misery, and everything in between. The young musicians studied at the conservatory in Algiers under the great master of chaabi, El Hadj M'hamed El Anka. They also played together in the bars and cafes of the Casbah, says 76-year-old Rachid Berkani, a Muslim oud player and singer. "Chaabi was created in the Casbah of Algiers," he says. "You know, the Casbah of Algiers is the cradle of Algerian artists." Like the players themselves, the music is a mix of cultures: North African polyrhythms, Andalusian classical music, jazz, flamenco and French cabaret. Then it all fell apart during and after Algeria's war of independence from France. The Jewish musicians, considered French citizens, fled to that country. After independence in 1962, the government forcibly relocated many Muslim neighborhoods. Some of the musicians went on to professional careers. Some played only for themselves. 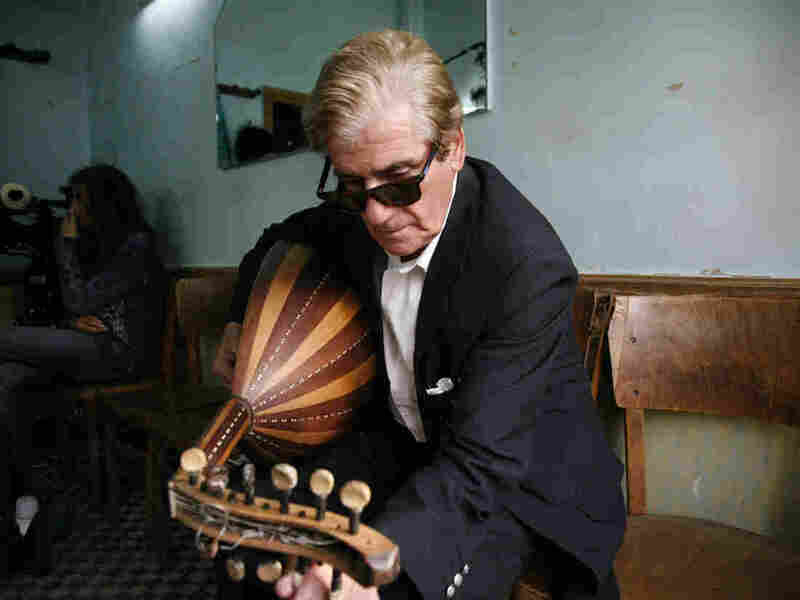 Others stopped performing music altogether — especially during the 1990s, when Algeria was racked by a civil war between the government and Islamist groups and playing music became a dangerous profession. Forty years later, a young woman of Algerian descent living in Ireland decided to visit Algiers on vacation. Safinez Bousbia was wandering through the souk — the bazaar — where she met an artisan who made and decorated mirrors. She decided to buy one as a souvenir of her trip. "I was complimenting the mirror that I was going to buy, and I was like, 'Oh, it's so beautiful, it's hand-painted and stuff,'" she says. "And I said, 'Oh, you're such an artist.' And he goes, 'Of course I am! But I'm not only an artist here, I'm also an artist in music.' And I'm like, 'Really?' And he goes, 'Wait a second.' And he pulled out all of this memorabilia of his years as a musician. "And then I start asking him again about the mirror," she says. "And he says, "Tsk! Leave the mirror! Let's talk about this now!' So it was quite hilarious." The mirror maker's name is Mohamed Ferkioui. He plays the accordion and piano. And, as his story unspooled, Bousbia got a crazy idea. She didn't know anything about music; she was 23. She was supposed to finish her master's degree in architecture back in Ireland after this vacation. But she canceled her flight and decided to track down all of the surviving chaabi players. She was going to get the band back together. "Basically, I had to find the old guardian of the conservatoire, the music conservatoire," Bousbia says, "and through him I found all the records, because the records were all removed in the '90s because of the terrorists; Islamic terrorism was attacking all the music institutions and all. So when I found them, I was finding all the original addresses in the Casbah, so I was going back to these original addresses and asking where these neighborhoods were moved. And then they would tell me this neighborhood was moved to this outskirt. So then I'd go to the outskirts and do door-to-door. And then, thanks to the GPS of the locals, which they call it, that way, it's all the bakers, the butchers and stuff, and they'd help you to locate the person... And the problem is that in Algeria there are no addresses, really. So they'd be like, 'Oh, by the third tree, turn left, and by the electric pole, turn right.' And you're like, 'Oh, excuse me? Which one?'" It took Bousbia almost 10 years. She was diagnosed with breast cancer, but following treatment, she resumed the project. She managed to find the surviving musicians, now all in their 70s, 80s and 90s. She convinced them to pick up their instruments and get together again, though they had been spread out between Algeria and France. And Bousbia the architect turned into a filmmaker: She made an acclaimed feature-length documentary about the musicians' reunion called El Gusto. The musicians translate that as "the good mood" — and that's what they call themselves. Nearly a decade after Bousbia's chance encounter in an Algiers bazaar, the musicians are gathered on an outdoor stage in Manhattan, invited by Lincoln Center. It's El Gusto's first American concert. They are unbelievably charming. Guitarist and singer Luc Cherki is the irrepressible storyteller, making up lyrics on the spot about their visit to New York. The crowd goes bonkers when Mohamed Ferkioui, the accordionist turned mirror maker, dances around the stage during the last few songs. And Luc Cherki says he still can't believe that this all has happened. "I'm so happy to have found all of my friends again," he exclaims. "And if I may be permitted: Come, all of you, and you will understand what this music is, our chaabi." They're lucky to be back together again after all these years — the audience knows it, and so do the musicians.